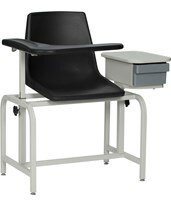 Blood Draw Chairs are used by phlebotomist to collect blood samples for a variety of medical reasons. 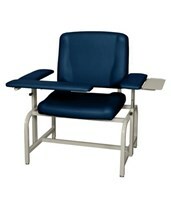 Phlebotomy is safe when done by a health professional with a comfortable and secure blood drawing chair. 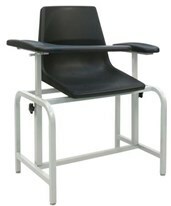 Here at Tiger Medical we offer a selection of blood draw chairs from top brands like Clinton Industries, Brewer, UMF and Winco. 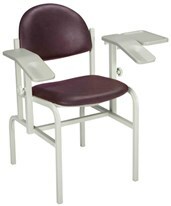 Blood draw chairs and ENT chairs are available in many sizes from bariatric to extra wide, extra tall and extra tall & extra wide. Many of the chairs come with a drawer or cabinet on the side for extra storage. 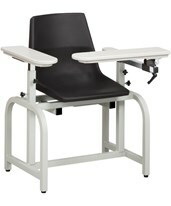 Check out Wincos Designer Blood Drawing Chair that boasts a power adjustable seat height with electrical power lift foot control. 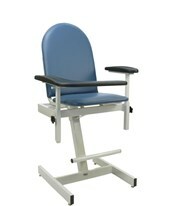 The seat can be lower for entry/exit and higher for medical procedures. 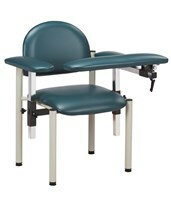 Other great features you will find are fully articulating arms and low seat height for easy access. 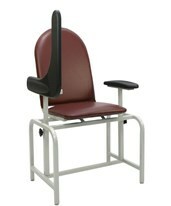 Auto-positioning allows for auto-adjustment of the armrest and leg sections to match the backrest angle. 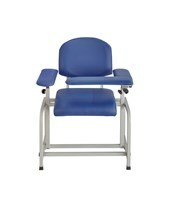 Clinton Industries offers a variety of ultra comfortable padded chairs. 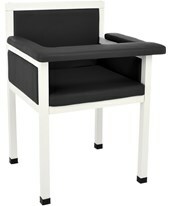 They are upholstered in a heavyweight vinyl that is available in many attractive colors. 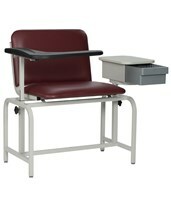 When choosing a blood draw chair consider your patients needs, how much space is available, and the frequency of use. 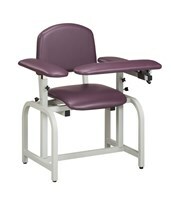 At Tiger Medical we offer affordable choices designed with both attendant and patient in mind. If you have any questions please call our friendly customer service for assistance! 300 lbs. 5 Year Warranty See Options 20" 54 lbs. 6"
Patient Weight Capacity of 350 lbs. 350 lbs. 2 Year Warranty 20.5" 56 lbs. 400lb 5 years limited warranty 90* 20" 6"
300 lb 5 year warranty Flip Up 20" 80 lb 27" - 33"
350 lbs 5 Year 15° 22" 29.5" – 38"
750 lbs. 3 year limited Flip Up 21.25" 148 lbs. 25", 29", 33"
300 lbs. 1 Year Limited Flip Up 25.5 - 31 inches 65-73 lbs. 33 - 44.5"